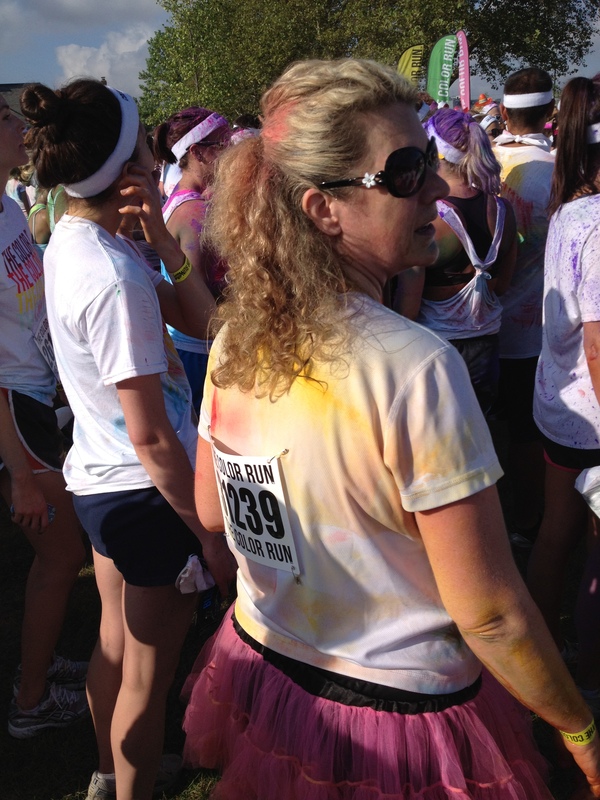 This morning I had the pleasure of completing The Color Run in Indianapolis. It was sold out but I was lucky enough to be gifted a bib from a friend who signed up and wasn’t going to make it. 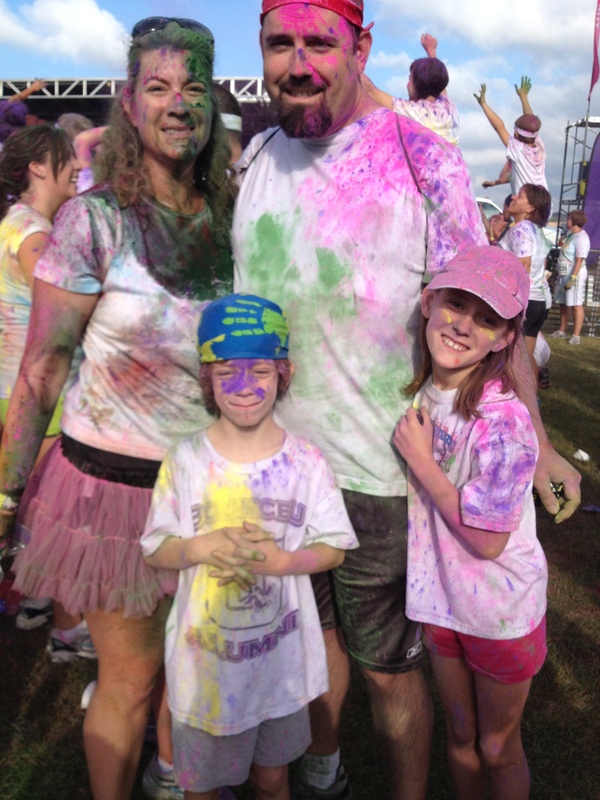 We went as a family so Babu and the kids could spectate and join me at the finish line color party. 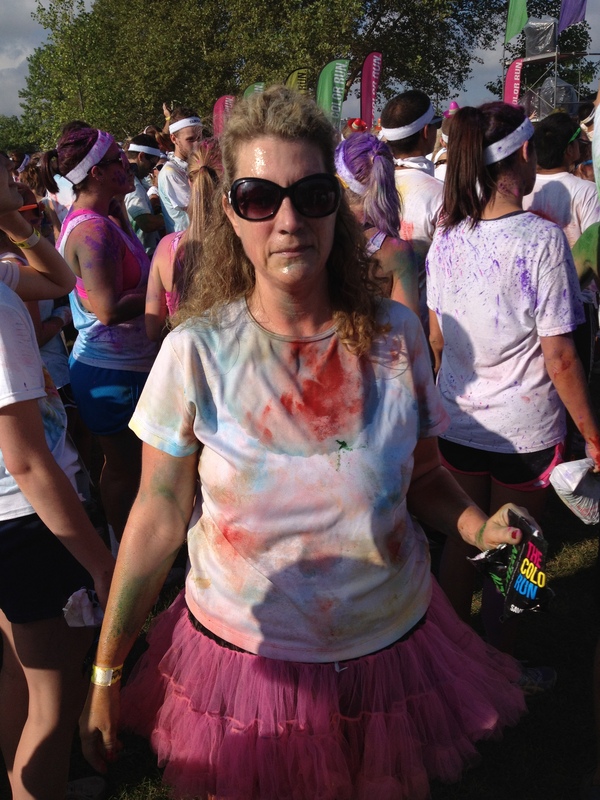 If you have never heard of The Color Run, it is an untimed 5K with color stations at every k where runners are sprayed or otherwise coated in different colors as they run or walk, or dance through. There were things I liked and things I thought they could improve upon. Almost everyone wears a white shirt and many wear something else fun, like tutu’s or crazy knee socks, headbands etc.. I wore a pink tutu. They give you one color bomb packet when you pick up your race gear and you can buy other packets at the party for 4 for $10. So both kids were able to have 2 packets of color for the party. The DJ/Emcee did a good job of pumping the pre race party up as everyone stood in the chute waiting for the race to start. The early packet pick-up was at a running store in the next town over so it was easy to grab my race gear beforehand and avoid waiting in line on race morning. 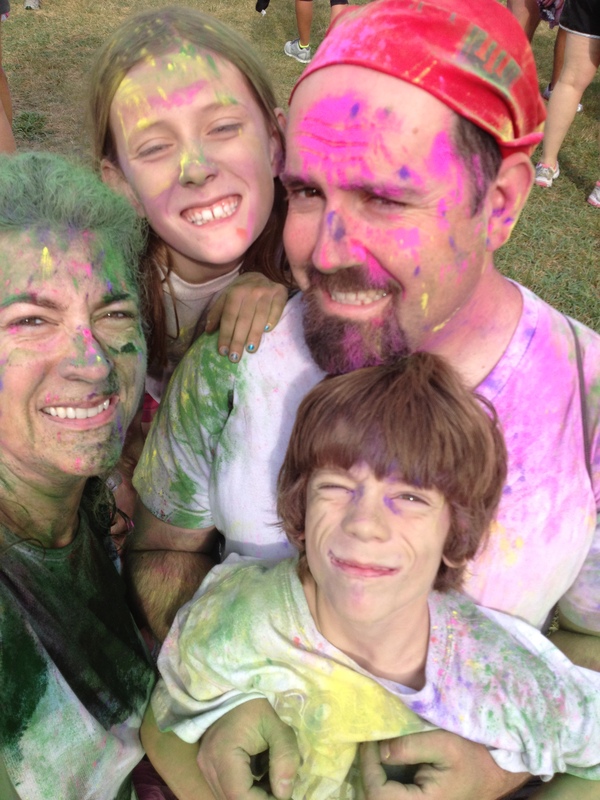 The Color Party afterwards was really fun, we threw color bombs about every ten minutes and our family enjoyed it through roughly two throws. I ran without a phone because I didn’t want it to get covered in color, this was kind of nice because I had nothing and no one telling me what pace I was or wasn’t keeping. I was able to simply run with my hair down and the wind and sun in the face. A color station at each K gave me something next to concentrate on, I like being able to break runs up into chunks. No one on the course had any kind of attitude, everyone was just there to have fun and it was a nice vibe. I went on the website and looked at the pics, read the FAQ’s and did some general reading about the race. So based on that, I was expecting to come off the course covered in color. They even have detailed drawing of the color stations and how the outside lanes are high color zones and the inside lane is a lower color zone. All the pics show people with lots of color. In my head I was imagining some sort of powder spraying contraption at each station. I wore an old white shirt, old shoes and sunglasses in order to plan for getting colored on the course. I wore my hair down for this race because I have always wanted to do that and it seemed like the perfect opportunity to try it out. I had visions of color covered hair upon finish. In reality there were maybe 12-15 people at each color station to man the whole thing, and they were squirting the color out of big squeeze bottles, or throwing it out of 55 gallon drums with their hands. So if you wanted any color you had to be sure to get all the way over to the left or right, then get in the long line to get through the station and be squirted. Hardly anyone got very much color at any station. I managed to get some more at the later stations because I made sure to dance a little and turn a little through the line and basically force the issue. I was very disappointed in the lack of color on the course. The web site makes it look like everyone is just simply coated in the stuff and you need to pay $45 for this race ( a STEEP price for a 5K) so you can be too. Then when you get there it was like, this is it??? Big let down. I found out a friend of mine worked a color station and asked her if she thought they were undermanned. She reported back that the guy in charge at their station remarked it was the smallest group of volunteers he had ever seen and usually they have 20-25 people manning each color station. Hers had 11. There was one water stop on the course, which is fine for a 5K, the problem was I was in the 2nd wave and the volunteers already could not keep up with those needing water. It looked like they were trying to fill the usual small plastic cups with water from some sort of water station contraption, like a soda fountain. The organization also states on their site that they want everyone to bring their own re-usable water containers to “be green”. So I wasn’t expecting to be handed a bottle of water at the finish, like ALL the rest of the 5K’s I have run. I saw roughly no one with a re-usable water bottle on the course or at the after party. Except for my kids because we packed them both full water bottle containers before we left the house at 6:30am. Plus, if you’re just going to use the same plastic coated cups that I see at every race for your station but you want to be green, well I just don’t see the point. Usually when I reach the finish line of a 5K, there is a cadre of volunteers lined up in an after chute fashion handing out water, or manning tables lined with bananas, maybe bagels, perhaps cookies, sometimes even chocolate milk. I realize that a 5K isn’t but a tiny training run for those of us who run any sort of distance, but considering the high number of walkers I had to bob and weave through, the number of small children I saw throwing fits about how they didn’t want to go any further, and the number of groups panting about it’s only x more K, this probably wasn’t just a tiny training run for a good portion of the 10,000+ participants. I had a great run, Babu said I came through the finish in the first couple hundred runners. Once I was through the banner there was…. NOTHING. After some searching I noticed two tents set up on either far outside of the park, wandered over to one and they were pouring out tiny cups of trial sized muscle milk and some sort of tea, obviously vendors. I needed water dammit, so I looked some more then wandered over to the tent on the opposite side of the park and found, you guessed it, small usual plastic cups being poured out of a water machine manned by roughly 4 volunteers who couldn’t keep up. Most runners were grabbing 2 cups, because we JUST RAN 3.2 miles and after any run you need water. There was no nutrition of any kind. zero, zip, zilch, none. Can you imagine how the later finishers must of felt being out in the heat longer due to their wave start and/or slower walking/running times. I was infinitely glad I ate a protein bar for breakfast at 6am. Being doused in color while running was fun, being in the middle of 100’s of people throwing color powder is fun, for about an hour. After that you start to notice that it is in your nose, mouth, ears, matted to your hair, bleeding through your clothes to your skin; you get the picture. The pink is the worst, I have pink spots on my skin and hair that are going to stay that way for a few days. I have a pinkish tinted cell phone cover. I had to scrub my face, hair and body repeatedly to even begin to make a dent in the mess and parts of my body are still stained in colors other than pink. Yes I knew this going into the event, yes I just complained that I didn’t get more colored during the race, yes I got my bib for free ( thanks Granny P), but do not underestimate the GIANT MESS this stuff makes. Overall I’d give The Color Run 3 stars and I probably won’t ever do it again. It was fun to do once, it was fun to have the family join me, it was not worth the let down during the color stations, lack of volunteers and hydration/nutrition for the $45 a bib price they feel is fair to charge.